Investing in gold and silver for your financial future places you in a market that may be unfamiliar to you. What you need is enough information to help you purchase wisely. 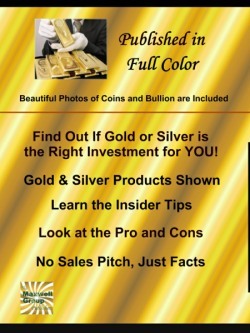 Buying and Selling Gold & Silver steps you through the process. It also contains a Glossary so the new vocabulary you need is right there. Wow! Life in the precious metals world is fast-paced and hectic. It conjures up scenes of a Wall Street trading floor. Fast-talking sales people dazzle you with new products and amazing stories about future profits. All you need is knowledge of the gold and silver products you want to buy (or sell) to hold your own in this world. Learning the new vocabulary saves you from being diverted from your goal by fast talking salespeople. Ask for what you want, find out the asking price, arrange the payment details, and you are done. Simple when you know how. If you decide what gold and silver products are the best investment for you before contacting a dealer, the transaction is completed effortlessly. 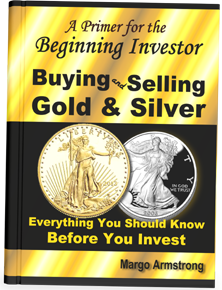 Buying & Selling Gold and Silver gives you the advantage, start your new investing adventure with all the facts you need. Find out now by purchasing this straight-forward eBook and get started planning for your financial future. Beautiful photos of the coins and bullion are included. Old Gold Coins - Are They a Good Investment?